Everyone has experienced fear at one time or another. Sometimes it is a healthy fear as in the case of if we encounter a lion that wants to eat us. But, some people live in a constant state of fear that is not related to a survival mechanism. This state of fear is one that is based on a perception that even non-threatening things can cause us harm. This being said, it is important that if we experience fear, that we look at it from God’s perspective to deal with it effectively. 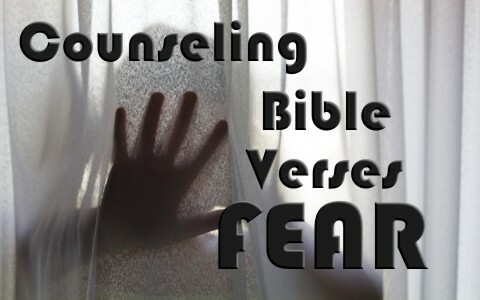 Therefore, it is important to be familiar with key Bible passages about fear for counseling those who are struggling with fear. What does God say about dealing with fear? When it comes to counseling people with fear, there are several key passages that should be considered. The first thing is to realize that fear is an emotion that is generated by our thinking. Therefore, fear is a state of mind. In certain situations, we might have a fear of being attacked by a bear. However, consider the fact that Daniel was cast into a den of lions, yet when the king hastily came to the den in the morning, Daniel responded excitedly how God had sent an angel to shut the mouths of the lions (Daniel 6). The fact that Daniel had obeyed God rather than an ungodly law set his heart toward trusting God in the situation instead of being gripped with fear. When it comes to overcoming fear, the Bible also tells us that prayer and focusing our thoughts on the things of God will guard our thinking and take away fear. The following verses illustrate the same. Everyone has experienced fear at one time or another and although there is much more that can be mentioned, no matter what the situation, when we are confronted with fear, we can trust that God can give us peace and deliver us from fear. Previous post: What Is The 1st (First) Commandment In The Bible? Next post: What Does The Bible Say About Martyrs?